You’ve seen the promise of DVD — high-quality movies delivered on media that won’t degrade over time with the added benefit of interactivity. Hollywood delivers most blockbuster movies via DVD now, sparking a revolution in the way you view video. DVD players are among the most rapidly adopted technologies ever. Every day, more and more people are able to view DVDs on their TVs or computers. Now, you can share your movies, music, and pictures with one of the world’s fastest-growing audiences. DVD-Video discs are the ideal way to distribute the movies and pictures you create on your computer. 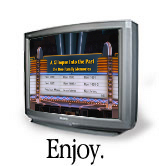 Unlike VHS tape, DVD retains digital quality images and sounds and allows you to create an interactive experience. In addition, DVDs are more compact and more durable than videotapes. We make DVDs that have the same features as a Hollywood production. Just collect your movies and still pictures and choose a theme and navigation. We're ready to create a living masterpiece. We’ve made the whole process easy, affordable and convenient. Because we use the video and photos you have already created, we just need to capture your movies with our high quality MPEG encoder, and photos with our professional level scanners, edit and arrange the photos and video with our state of the art Movie and DVD Editing Software, and then save the project to DVD. With our breakthrough affordable prices, thumbprints Multimedia Inc. is bringing DVD creation home. Don’t make your family squint at tiny postage-stamp size movies of precious moments. Give them something that will last virtually forever — a shiny DVD made exclusively for you. Up to two hours of digital TV quality video per DVD. Interactive Menus, buttons, and slide shows. Copyright © 2000 thumbprints Multimedia Inc. All rights reserved.